The Nexus One is clearly the most innovative phone to hit the market since the iPhone. And with the Nexus One being a Google product, of course we can expect advanced features to be “standard” with the phone. 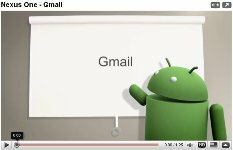 One of the “advanced” features – or I should say “amazing” features – is that with the Nexus One you can manage multiple Gmail accounts. That’s right, add as many Gmail accounts as you’d like and they can all be managed directly from your Nexus One. Plus, all Gmail accounts are synced automatically when you use your phone – so no need to worry about missing that important email.